Laser cutters, 3D printers, sewing machines, injection molders, welders, notchers, planers, lathes, hand tools, computers. 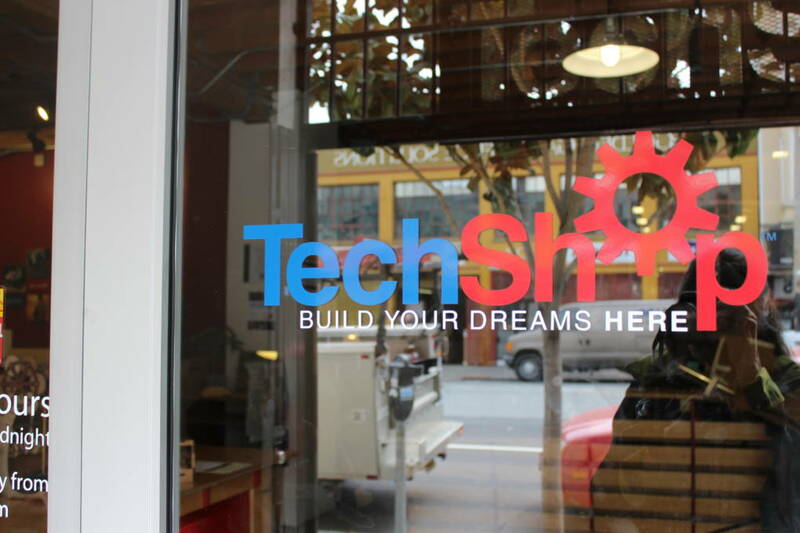 Enter TechShop, San Francisco—three vast floors of every kind of maker’s tool imaginable. TechShop is a community based workshop on a mission to democratize access to the tools of innovation. There are three TechShops in the Bay Area.”A member can come in with an idea, take a class and three hours later they can be cutting stuff and making amazing progress,” says Blaine. Blaine Dehmlow, Shop Manger SF TechShop and Jesse Harrington Au, Maker Advocate at Autodesk. “I’m an analog guy,” says Blaine. “The ‘hammer’ of Tech Shop,” interrupts Jesse. “We’ve missed a whole generation of inventing, of working with our hands, taking shop in school,” says Blaine. “But if you’re a high school…,” Jesse argues.A gigantic water lathe fires up next to us, drowning them out. The two are a comedy team, playing off each other from opposite ends of “the making” spectrum. They’ve actually started doing a weekly podcast together which they record on their lunch break live from TechShop SF. It’s called Safety Third. “We built a roadster,” says Jesse. “We’re making watches. We call it CAD to craft. The two ran a guitar making workshop at TechShop. Thirteen people each made a guitar in six days. At the end of the sixth day everyone had to play their guitar. Near the front door sits a rugged, hip looking bamboo bike. “Putting the bamboo pieces together was the problem,” Blaine says. Their solution was fiberglass orthopedic tape, the kind the doctor uses to make a cast when you break your arm. It hardens quickly and it’s cheap. They took the first bike up on the TechShop roof and threw it off — eleven times with no failures. The piece is a robotic gamelan orchestra created by conceptual artist and composer Aaron Taylor Kuffner. After studying in Bali Kuffner created the piece as part of a residency at the TechShop. “When people come in they’re really putting it all on the line,” says Jesse. “Jesse makes fun of me because I come from that old side of the tradition and I make fun of him because all he does is double click on a little mouse and thinks that he’s made something,” says Blaine. “But the truth is that when we’re done fighting, I’ve been able to work on projects like our car. I already knew how to build it, but I couldn’t complete the design phase of it without the software and the modeling side. “So now I’m a believer. But I just need someone who’s twenty years old to do it for me and I just buy him pizza or beer. I am intrigued about the roadster plans. How can I get them? I think with the 3D printer making of obat keputihan gatal berbau becomes easier and faster. parfum choirose hope someday to have a business unit such as TechShop.